ONCE merely a pit stop on the way to Penang, Ipoh has evolved into a destination in its own right. Malaysians descend upon the capital city of Perak in search of the best silky tau foo fa (tofu pudding), kai see hor fan (kuey teow soup with chicken) and heong peng (fragrant pastry), to name but a few, as well as a soak in the mineral-rich waters of its famous hot springs. The relatively smooth traffic is a welcome change from the bumper-to-bumper chaos of Kuala Lumpur during peak hours. However, for Steven Kuak, Ipoh is a market to expand into. 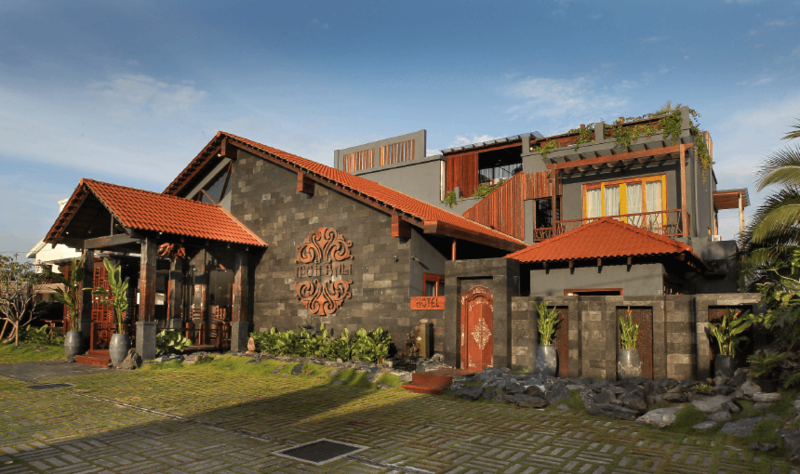 The entrepreneur first ventured into the hospitality business a couple of years ago with De Botani Hotel, a two-star, 44-room budget lodging in Bandar Siber. Its steady success encouraged him to open another hotel, an upmarket boutique hotel chiefly targeted at those traveling on business. Banish the idea of a cold, impersonal business hotel. Its very name alludes to the influences behind Ipoh Bali Hotel’s aesthetic — marrying small-town tranquillity with tropical island rejuvenation. The sprawling property is located off Jalan Tambun in a residential area a short drive from town. “Everything is a short drive away in Ipoh,” jokes marketing manager Khoo Chung Yee. When he bought the lot two years ago, Kuak demolished the old bungalow that stood on it to build his dream hotel. It seems somehow misplaced upon first impression, a dark façade juxtaposed against cheery-white low-slung properties along Lorong Cheah Cheang Lim. Volcanic stone forms its frontage, a sophisticated black canvas softened by wood, foliage, rock and water. In fact, wood plays a central role in the overall aesthetic. 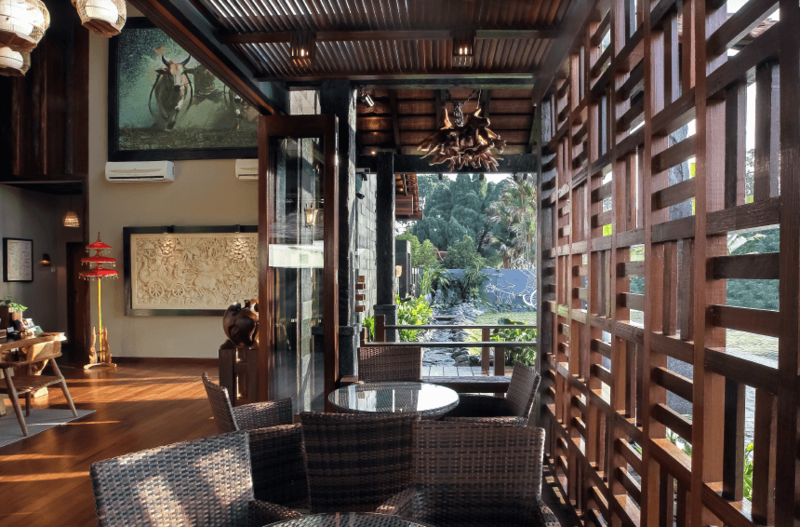 The soft-spoken Kuak, who has lived in Ipoh for the last 20 years, adores the classic appeal of the material, preferring to use solid hardwood to reinforce structures and infuse an evergreen, tropical feel to the design. Sourcing was an extensive process — he did not merely visit a timber yard and point imperiously at blocks that struck his fancy. He and his friends unhurriedly acquired individual pieces from around Perak and Bali, Indonesia. The Perak finds are especially meaningful as most of them are reclaimed and enriched with their own history. The massive pillars flanking the bridge-like walkway to the front entrance, for instance, were part of the Lumut jetty while the door frames are salvaged KTM railway tracks. Kuak says their sentimental value is priceless and their patina and almost imposing solidness impart a sense of perpetuity. 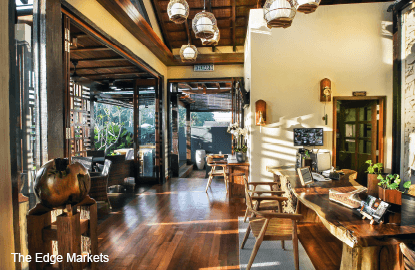 Stone and wood are also quintessentially Balinese and thus used liberally, complemented by water flowing throughout the ground floor spaces. At the entrance, it trickles over black rocks unique to Sungai Siput. A wraparound terrace hugs the left side of the hotel, an affair executed entirely in wood, including a screen with cut-outs that keep out prying eyes while letting in a gentle breeze. Here, breakfast is enjoyed at round or picnic-style long tables, with nasi lemak and similar local delights topping the menu. The reception hall carries the same elements of wood and stone but with unexpected touches. Above a large archetypal stone carving of horses chomping at their bits is a picture of a man riding between two galloping bulls with a foot on each of saddle. The high-octane intensity and vivid colours contrast with the cool white of the stone carving below. A full-height stone carving stands tall behind the counter. Commanding attention above it are rattan bird cages cupping white globe lights. They were assembled by the hotel team. For the best showcase of design, however, the superior room, also on the ground floor, comes highly recommended. Smooth cement slabs form the wall and keep the interior naturally cool while wood and warm colours — particularly in the pleasing tangerine of the heavy curtains and throw pillows — instil welcome. That this is abusiness hotel is made evident by the availability of ample plug points. One would be hard-pressed to settle down for a session of hard work, though. Open the sliding doors and the most Zen of scenes awaits. A wooden veranda gives way to a narrow koi pond, which runs the perimeter of most of the ground floor rooms, and lush shrubs hug the facing wall. It’s all too easy to imagine whiling away the hours in the hanging chair, reading or watching the colourful koi do methodical laps aroundthe pond. The rooms are arranged around a central courtyard, from which a 60-year-old pokok cempaka (purchased from a Malay kampung) stretches up to greet the sun, though not very successfully. Up two flights of stairs is a bare-bones rooftop bar. It doesn’t sound very promising on paper — after all, it’s only two floors above ground — but Ipoh’s low-rise skyline is phenomenal, set against the limestone hills beyond. A timber table, complete with incredibly heavy solid chairs, runs the length of the more picturesque side of the rooftop. This is the best place to catch the sun sinking into the hills, have a chat or just sit in quiet reflection. Ipoh Bali Hotel might have been built for the business crowd but its serenity, unfussy loveliness and warm hospitality are exemplary of the old town. It’s precisely these qualities that the weary city dweller seeks when he or she makes the sojourn north — thus the hotel might find itself catering to a wider audience than was intended. It’s almost inevitable, really. This article first appeared in haven,digitaledge Weekly, on Issue #74 August + September 2015.